The gunman who killed five police officers in Dallas was "changed" by his experience in the US military, his mother has said. 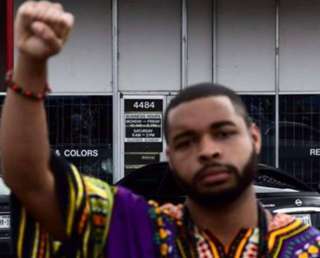 Micah Johnson went from being an extrovert to a "hermit", Delphine Johnson told The Blaze website. Johnson opened fire at a protest being held over the deaths of African Americans at the hands of police. The demonstrations, echoed nationwide, followed the police killings of Philando Castile in Minnesota and Alton Sterling in Louisiana. Bomb-making material, rifles and a combat journal were found at the home of Johnson, who was himself killed. "I don't know what to say to anybody to make anything better. I didn't see it coming," James Johnson, his father, told the website. "I love my son with all my heart. I hate what he did." Dallas police chief David Brown said all of the officers are on edge after the events and that his family has received death threats. He said 13 officers used force against Johnson during the stand-off, in which Johnson was killed by a robot bomb. Killing Johnson was "not an ethical dilemma", he said. "I'd do it again" to protect fellow officers, he said. The events will not discourage the department, Mr Brown said, which has seen 12 consecutive years of crime reduction in Dallas. "We're going to turn over every rock" to make sure Johnson was the only person planning the attack, he said, and that the department is following "any and all leads". Mr Brown suggested angry young black people in the US join their local police departments and try to become "part of the solution". "We're hiring," he said. "Get off the protest line and put in an application." A picture featuring a woman in a dress standing calmly before two heavily body-armoured police officers during a Black Lives Matter protest in Baton Rouge, Louisiana, is circulating on social media. The woman, Ieshia Evans, responded on Facebook, saying: "I appreciate the well wishes and love, but this is the work of God. I am a vessel!" Republican presumptive presidential nominee Donald Trump, speaking at a campaign event on Monday, mentioned the events in Dallas and said it's "time for hostility against police and all law enforcement to end immediately". "I am the law-and-order candidate," he said. Presumptive Democratic presidential nominee Hillary Clinton, speaking last week at the Emanuel AME church where nine worshippers were killed last summer, said bias exists in some police departments.